A team of 6 Pears from Pineapples took part in the Project Ability, Sportshall Athletics (Sainsbury’s School Games Level 2) competition at Corby Technical School. Each of the schools taking part in the competition, moved around an event circuit and earned points depending on how fast they ran; how far they threw; how accurately they threw; how far they could jump and quickly they could bounce. The competition was organised and run by a team of Young Leaders who kept the scores and helped the children with the events – Speed Bounce (jumping side to side, over a small hurdle, as many times as possible in 30 seconds); Target Throw (throw a bean bag into a hoop); Standing long jump; Chest Push (from the chest push a large ball as far as you can) and Hurdles race. 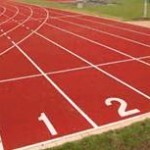 Whilst all the points were being added up, all the children took part in a series of running races. In the end it was a very tight contest with only a couple of points separating the top teams and Rowan Gate finished in 2nd place. Well done to Woodnewton who finished 1st. 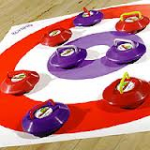 All the children from Peaches class competed in the Inclusive New Age Kurling (Sainsbury’s School Games Level 2) competition at Southfield School, Kettering. Inclusive meant that children from mainstream schools also took part. The other schools that took part were Beanfield, Woodnewton, Loddington and Isham. All the children from all of the schools competing were divided into smaller teams (pairs), to then play against every other pair. In New Age Kurling the stones are on wheels and if needed the stones can be pushed down a ramp. After that the idea is the same as Curling – to get a stone to the centre of the target (points are awarded for the nearest). Once all the points had been added up, a series of play-offs took place and Rowan Gate finished a creditable 4th (out of 8). In the event of adverse weather conditions, the school will make every effort to remain open. The decision to close the school will be based on whether School transport is operative.